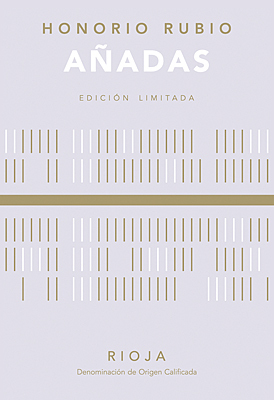 Honorio Rubio’s “Añadas” is a groundbreaking, non-vintage white and the top wine among his five limited production series wines. It melds the bright acidity and complexity of a top-class barrel-aged white with distinctive wood nuances evocative of fresh Fino Sherry. It’s a remarkable powerhouse of a white, destined for long agreeability, but completely enjoyable now. It began with Honorio’s efforts to explore traditional methods of stabilizing wine and the idea of creating world class whites with his best grapes. For “Añadas” Honorio took cues from the hundreds of years old traditions of both the Sherry solara system and the long barrel-aged whites of Rioja, plus the natural wine movement’s valorization of lost techniques. The result is a category bending white of exceedingly high quality. In the most straight forward of terms: it’s simply delicious and fascinating too! This edition of “Añadas”, bottled in July, 2012, is a brilliant, pale golden straw color blended from the 2007, 2008, 2009 and 2010 vintages. The nose is effusive with scents of fresh baked lemon chiffon cake with vanilla and butter notes and hints of pine wood and anise. The attack is explosive, bright and crisp with a core of lemon and ripe pear flavors. It builds from there on the ample, but balanced mid-palate with butter, cream, Nilla wafer and marshmallow notes. The finish is fresh, exotic and very long with lingering flavors of tapioca, mango and toasted pineapple. A tour de force and re-imagining of what white wine can be. 1500 numbered bottles made. Elaborated in an innovative, solera-like method of blending multiple vintages in barrels of new and used French & American oak and 5% Bulgarian acacia. Made from vintages 2007, 2008 2009 and 2010, and aged 5 years before bottling on July 16, 2012. 1500 numbered bottles made.